on D-Day, June 6, 1944, the men of the 16th Infantry Regiment, 1st Infantry Division, of the U.S. Army assaulted Omaha Beach with the initial waves of Allied forces. their landing did not go well. they encountered entrenched, well-fortified, and motivated German defenders who proceeded to counter-attack with the full arsenal at their disposal. the 16th Infantry Regiment was decimated, trapped along a narrow beachhead fully exposed to enemy fire. shocked, confused, lost, exhausted, the men who survived the landing found themselves by 0800 hours huddled along the Normandy seawall taking sniper rounds, machine gun bursts, and artillery blasts in a state of utter carnage and chaos. their situation, along with the Allied invasion, had become tenuous. 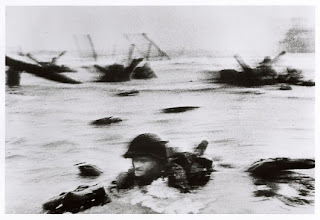 at that moment began one of the most legendary exploits of D-Day. "there are 2 kinds of people who are staying on this beach: those who are dead and those who are going to die. now let's get the hell out of here." ignoring enemy fire, he proceeded to walk along the seawall, motivating the men and organizing them into units. he then coordinated their attacks towards a specific target on the defenses. their attack worked; they managed to open what was the only exit off the beach in the early hours of D-Day, and allowed the Allied forces to move off Omaha Beach and take out the German positions. it's worth remembering this story, not just for its commemoration of the experiences and sacrifices made by those involved, but also for the lessons it leaves for us. taken as an allegory, we've all had experiences where the situation was grim. where things were not going well, where the odds were poor, when misfortune seemed the rule and one bad thing was followed by many many more. and as much as in hindsight those times may have turned out trite, there were also those times when it was not--when the danger was very great and very close and very real and very much meant the extinguishing of even so much as lives: including ours and those around us. and knowing how the universe works, those times may be before us still...those times may be now. and in such a situation, we may find ourselves fully exposed. shocked. confused. lost. exhausted. caught in the carnage and chaos of what life is doing to us. and at that moment, we may wish for a Colonel Taylor to come striding before us and guiding us towards what we should do. except that's where the allegory fails. because in our lives--our real lives--there very often is no Colonel Taylor we can expect to come save us. no hero we can count on to defend us. no one else we can rely on to help us. there is instead so often, very often, too often, just us. and so often, very often, too often, others who depend on us. but it's then that we need to remember Colonel Taylor's quote. we need to remember what he said. more than that, we need to remember what he meant. there is nobody coming to save us. there is nobody except ourselves. and if all we do is nothing, if all we do is stay where we are, paralyzed, in fear, in despair, in turmoil, in pain, in suffering, then the only fate that is left to us is to be devoured by the afflictions that torment us. if we are to have a chance, any chance, of survival, then we have to look to ourselves to face our suffering and do whatever we can with whatever we have in whatever way we are able to act and move and do and advance and proceed forward. even if it means crawling along the sand one inch at a time. because crawling means a chance of survival. crawling means a chance of life. crawling means a chance of hope. and because there are only 2 kinds of people who are staying on the beach: those that are dead, and those that are going to die. it's time to get off the beach. those of you in the cycling and triathlon communities are probably buzzing over the news about Lance Armstrong and USADA. if you weren't caught by Armstrong's statement that he would no longer contest USADA's charges (reference: Lance Armstrong's statement) or USADA's subsequent stripping of his Tour de France victories (reference: USADA stripping of TdF titles), then you should be in the wake of USADA's release of its report on its investigation of Lance Armstrong. i held off posting about Lance Armstrong because i wanted to wait for the USADA report to come out and evaluate it for myself. i wanted to see just what USADA had uncovered and just what evidence it had against Armstrong. especially since USADA had said it ran over 1000 pages, making it one of the more--if not most--comprehensive investigations into Armstrong and doping in professional cycling that's ever been conducted. coming from a legal background, i was particularly interested in the weight of the evidence behind the allegations of doping. going beyond the USADA report, i have very mixed feelings about this entire situation. to me, it's in some ways simple and in some ways complex. it's simple in that the weight of evidence is now about as close to convincing (by the legal standards of a preponderance of evidence, clear & convincing evidence, and even beyond a reasonable doubt) against Armstrong. i recognize that without a "smoking gun" that much, if not all, of the evidence is circumstantial, but legal cases, even criminal ones, are often tried on the basis of circumstantial evidence in the absence of anything more direct. i'm among those who first believed, later questioned, then suspected that Armstrong had, like so many others in his sport during his era, engaged in doping. now, however, i'm among those convinced that he did. it's also simple in that Armstrong was not the only one. in fact, i'm convinced that most, if not all, professional cyclists doped or are doping. and not just in the Tour de France. given the details of the USADA report, as well as all the other doping investigations conducted of other professional cyclists in recent years, i think it's clear that doping has and is widespread, common, systematic, and institutionalized not just as a culture among athletes but as a structure maintained by teams, sponsors, organizing bodies, and even government entities at all levels of professional cycling. the scale and intensity of it is just horrifying. given the scale and intensity, just what are the prospects of ever cleaning up this sport? when all elements related to the sport appear to be complicit or active in doping, who can be responsible for oversight or change? and even if you change the structure, how do you change the culture? given the scale and intensity, how do you change the record books? i'm not sure, but it seems that even though Lance Armstrong is stripped of his Tour de France victories, that all the other cyclists were also doping. in which case, do you have an entire era of cycling with races where the record books show *no* podium places? given the scale and intensity, is it time to heed the voices of those who think that attempts to stop doping in sport is futile? some people refer to the U.S. experience with Prohibition, when the U.S. federal government engaged in a vain attempt to stop alcohol that drove the industry underground and encouraged the rise of organized crime. such voices claim that it's hopeless to try and stop doping in sport, and that all sports, not just cycling, need to consider acceptance of it or allow categories for athletes who engage in it. sport is not just sport. athletes are not just athletes. sport and athletes are symbols and avatars for society at large. as public figures they exert an influence on society outside of competition. Lance Armstrong the cyclist became Lance Armstrong cancer fighter. the Livestrong Foundation has done a significant amount of work raising awareness and money to fight cancer. it has helped thousands, if not millions, of cancer victims and their families. what does the USADA report and the stripping of Tour de France victories do for them? should it do anything to them? will it change Lance Armstrong's role on behalf of them? should it change his role at all? is it really justice if the actions against Armstrong end up hurting all the people who have benefited from the Livestrong Foundation? it may be justice for cycling, it may be justice for all the cyclists hurt by doping, it may be justice for USADA, it may be justice for sports in general to take action against Armstrong. but is it justice if such actions hurt all those who have benefited from the Livestrong Foundation? for that matter, if action is taken against any and all cyclists who have doped, is it justice if it affects all the charitable work done by them? we might blame the athlete, but that's not much consolation if you're the one who's depending on the charity. i don't have answers to any of these questions. like i said, they're just thoughts. and to me, indicators of just how far the ramifications of the doping era in cycling--and in sports--goes. it's not just a sports problem, it's a society problem. i'm just shaking my head. like the kid said to Shoeless Joe Jackson in the wake of the 1919 Black Sox Scandal: say it ain't so, joe. say it ain't so. in case the link doesn't work, i've pasted the full text of the article at the end of this post. this is probably the best summary of the physical toll of an Ironman out there. i've read more comprehensive descriptions, with probably the best being Joe Friel's Going Long (which i also think is mandatory reading for any endurance athlete, triathlete or otherwise). and admittedy, this article doesn't delve too far into the mental aspects in terms of emotional and spiritual phenomena (of which, trust me, there are...there's a reason why the Tarahumara natives treat their 200-mile runs as spiritual exercises). but this helps to understand the physical demands being placed on the body and shows just how dangerous this sport really is. which is why i say that Ironman is not something to be taken lightly: you will pay the price for any mistake, any transgression, any weakness in body or character, in spades. it makes the distance the race of truth. the kind of truth we don't get from anywhere or anything or anyone else in our lives. which is why we love it so. In the past year Chris McCormack, Julie Dibens and Chrissie Wellington have announced they will take a step back from Ironman racing for various reasons. All were at the top of their careers and have emphasized the toll that Ironman training and racing takes on the body. The following story explains exactly what the body goes through over 140.6 miles of racing. From the outside, swimming, cycling and running appear as movement. But from inside the triathlete’s body, swimming, cycling and running appear as an acceleration of time. Blood gushes through veins and arteries like traffic through night highways in a timelapse video. Within muscle cells, glucose and triglyceride molecules are tossed into the fiery furnace of mitochondria at a breakneck pace, as though someone has put a DVD of the process at rest on 4x fast forward. Armies of oxygen radicals punch holes in muscle cell membranes, causing a general deterioration that calls to mind those computer animations that show a person aging 20 years in 10 seconds. time to start thinking about tickling the reaper again. Let’s take a more detailed look at how racing an Ironman affects various parts of your anatomy. There’s no particular lesson in this exercise, but it may give you a greater appreciation for the accomplishment of crossing an Ironman finish line. prime the muscles for activity. This anticipatory response is mediated largely by a primitive part of the brain called the periaqueductal gray area, which is responsible for regulating the cardiorespiratory response to exercise. That internal roiling you experience when you step out of your car at the event site on race morning, surrounded by your fellow competitors and the electric Ironman atmosphere, is essentially the same feeling your dog experiences when you show him the leash. When the race begins, the biochemical state of every system in your body changes as each responds first to the challenge of swimming 2.4 miles, then to that of cycling 112 miles and finally to that of running 26.2 miles. Among the greatest physiological challenges are core body temperature regulation, dehydration, fuel supply and usage, muscle damage, nutrition absorption and processing and brain fatigue. Core body temperature regulation is not a big issue in most Ironman swims, as cool (and even somewhat warm) water transfers heat away from the body very effectively. But the bike and run legs are a different story, especially on hot days. Almost threequarters of the energy that your muscles release during cycling and running takes the form of heat waste. If this heat were allowed to accumulate in the muscles it would eventually cause serious tissue damage. Your body has various means of preventing this heat from accumulating. The best known and among the most effective is perspiration. But the most effective of all is simply regulating your exercise intensity. The more you slow down, the less heat your muscles produce. That’s why you don’t race as fast on hot days. You might assume that your core body temperature begins to rise gradually at the beginning of the bike leg and continues to rise throughout the rest of the race, reaching its highest level when you cross the finish line. This is seldom the case. mistake these unpleasant symptoms as indications of heat illness, but they are actually products of a self-protective mechanism that prevents heat illness. But this self-protective mechanism has been known to fail. That’s probably because the brain itself can become too hot to function properly during exercise in hot environments. When this happens, the central nervous system begins to malfunction and the athlete becomes dizzy, disoriented and uncoordinated, and may collapse. muscle proteins and calories ingested during the event, usually in the form of carbohydrates. The balance of fuels shifts over the course of the day. During the swim and the first portion of the bike leg, carbohydrates are likely to provide almost half of the muscles’ energy, with fat providing an equal amount and protein just a sliver. As the body’s carbohydrate stores decrease, the carbohydrate contribution to forward progress diminishes and fat takes up the slack. By midway through the marathon, at the latest, muscle glycogen will have reached critically low levels in the calves, quads and hamstrings. Consequently, total carbohydrate contribution to continued running drops further, fat oxidation increases, and amino acids may provide as much as 15 percent of the muscles’ energy. The inability to supply sufficient energy to the muscles is one of the main reasons individuals who do not train for an Ironman cannot complete an Ironman. Endurance is strictly limited by the availability of glycogen in the liver and working muscles. When these stores fall too low, your day is done. Endurance training greatly increases the body’s capacity for glycogen storage. But even the fittest triathlete cannot store enough glycogen to fuel an entire Ironman. Thankfully, training also greatly increases the capacity to burn fats, which allows the athlete to conserve glycogen, making it last longer. The most visible effect of Ironman racing on the body is the production of tremendous amounts of sweat. Thank heavens for sweat. Perspiration is a vital cooling mechanism for the body. The blood carries some of the excess heat produced by the muscles during cycling and running away from the muscles to capillaries near the surface of the skin, where it leaves the body. Sweat glands then take up some fluid from the blood, and with it some heat, and release it onto the surface of the skin, where it evaporates, cooling the skin. Finally, cooled blood flows back toward the core of the body to absorb and distribute more heat. The only problem with this mechanism is that it’s essentially self-sabotaging. The more you sweat, the more your blood volume shrinks, and the more your blood volume shrinks, the less heat your circulation can carry away from the working muscles. However, contrary to popular belief, dehydration only slightly increases core body temperature. Its greatest effect is on performance, because as your blood volume decreases, so does your cardiac efficiency, or the amount of oxygen your heart can deliver to your muscles per contraction. walking or a painfully slow shuffle would be the greatest level of exertion possible. Even with the availability of sports drinks and water, most triathletes finish their Ironman races weighing a lot less than they did when they started. Nevertheless, rather modest amounts of fluid intake appear sufficient to enable the body to maintain blood volume, as the body can also draw fluid into the blood from other compartments (and, for that matter, much of the weight lost during an Ironman comes from the metabolism of fuels and the release of water stored with glycogen, which does not contribute to dehydration). A 2007 study from the University of Cape Town, South Africa, found that while participants in an Ironman triathlon lost nearly 5 percent of their body weight, their blood volume actually increased. Muscle tissue stress may be the single greatest challenge the body faces in an Ironman triathlon. Vast numbers of muscle cells are disrupted, damaged and deconstructed along the way. The main cause of muscle damage is mechanical stress, which is caused primarily by eccentric (pronounced ee-centric) muscle contractions. In an eccentric contraction, the muscle lengthens as it contracts (for example, during the lowering phase of a biceps curl) instead of shortening as in a concentric contraction (e.g., the lifting phase of a biceps curl) or staying the same length as in an isometric contraction (e.g., flexing to show off one’s biceps). The muscle is really being pulled in two directions at once during an eccentric contraction, like a tug-o’- war, so it’s easy to see the potential for tearing. A second cause of muscle damage during exercise is the breakdown of muscle proteins for energy, called catabolism. Protein is not a preferred energy source during exercise, but when carbohydrate stores run low in the later portion of an Ironman, protein is called upon increasingly to take up the slack. As mentioned above, by the end of an Ironman, protein may supply as much as 15 percent of the energy your muscles use to keep moving. If you’ve ever finished a long workout or race smelling like ammonia, that’s a sign you’ve been burning a lot of muscle protein, as ammonia is a byproduct of protein catabolism. When your blood glucose level drops during exercise, your adrenal glands secrete the stress hormone cortisol, which assists in breaking down carbohydrates, fats and proteins to release energy. Most of the proteins that it breaks down are found in your muscles. Muscle damage is also caused by oxidative stress during exercise. A small percentage (an estimated 2 to 5 percent) of the oxygen molecules that enter the body lose an electron while participating in energy release in the mitochondria, becoming “oxygen radicals.” This increases their instability and causes them to pilfer an electron from a living cell in order to regain stability. The result is often a chain reaction of “free radical” damage to cell membranes, DNA and various structural proteins. During endurance exercise the rate of oxygen consumption can increase up to seven times above resting levels, with a corresponding increase in the production of oxygen radicals. Just how much muscle damage does your body experience over the course of an Ironman? One of the chemical biomarkers used to estimate muscle damage is creatine kinase (CK), which leaks into the bloodstream from ruptured muscle cells. According to Bryan Berman, Ph.D., an exercise physiologist with Carmichael Training Systems, in a recovered state, the typical athlete’s serum creatine kinase level is approximately 125 U/L. Twenty-four hours after completion of a half-marathon, the CK level doubles. A day after a bike ride to exhaustion at 70 percent VO2max (a little faster than Ironman intensity), CK levels are as high as 700 U/L. And one recent study found that 16 hours after finishing an Ironman, triathletes had an average serum CK level of 1500 U/L, or more than 10 times the normal level. Australian professional triathlete Chris Legh had emergency surgery to remove half his colon after the 1997 Hawaii Ironman. A good chunk of the organ had literally died during the event due to inadequate oxygen supply. While this type of crisis is extremely rare in Ironman racing, and in Legh’s case was probably related to a congenital heart defect, completing an Ironman is stressful to the gastrointestinal system of every competitor. Common problems include stomach discomfort and bloating, nausea, vomiting and diarrhea. Ironman events. The gastrointestinal system cannot tolerate the same rates and types of nutrition intake during vigorous activity as it can at rest. Studies have shown that athletes who take in the most nutrition during endurance events are most likely to suffer gastrointestinal mishaps. If you’ve ever completed an Ironman, you know that the last few miles of the marathon are a unique experience that is only hinted at by the experience of running the last few miles of a regular marathon. Your body is so impaired from the beating it has taken over the course of the day, it’s almost funny. The simple act of lifting your foot off the ground to take the next stride feels akin to performing a heavy squat with a weighted barbell on your back. Research from the National Institute of Sport and Physical Education in Paris confirms that the energy cost of running at the end of a triathlon is significantly greater than that of running at the same speed without swimming and cycling beforehand. And that’s an Olympic-distance triathlon. part by local fatigue in specific muscles, which necessitates a change in form in much the same way you might start running with a locked right knee to protect a suddenly cramping right calf muscle. It’s neither efficient nor pretty, but it sure beats the alternative. In triathlons and independent runs alike, fatigue and loss of mechanical efficiency are associated with increasing ground contact time. The closer you get to the finish line, the harder it becomes to pry your feet off the road. This bit of bodily mutiny is caused by a weakening of motor output from your brain to your working muscles. It is your brain’s way of preventing you from running faster—and perhaps even forcing you to slow down—in response to feedback from your body. Your brain itself may become tired by the end of an Ironman—a phenomenon known as central fatigue. Like your muscles, it runs low on critical fuels and accumulates increasing levels of metabolites that interfere with its functioning, resulting in feelings of discomfort, loss of will to continue, fractured thinking, declining mood and reduced ability to fire the motor neurons that activate the muscles. It takes a good while for the body to recover from the stress of completing an Ironman. An Austrian study found that blood levels of antioxidant enzymes remained significantly reduced, while biomarkers of muscle damage and inflammation remained significantly elevated in triathletes nearly three weeks after they had crossed an Ironman finish line. The immune system plays a major role in helping the body recover after exhaustive exercise, but the immune system itself is overwhelmed by the stress of endurance racing and its aftermath. Immune cell function remains depressed for as long as three days after such an experience, greatly increasing the athlete’s susceptibility to viral and bacterial infections. The causes of this effect appear to be multiple and are not fully understood. Part of the problem is that the immune cells’ main fuels, such as the amino acid glutamine, are depleted during exhaustive exercise. It seems that the immune system also downregulates its inflammatory response to tissue damage to avoid out-of-control systemic inflammation that would otherwise result from the high muscle damage incurred. But this very downregulation impairs the immune system’s ability to fight foreign invaders. Triathletes also commonly suffer from a malady known as the “post-Ironman blues” in the weeks after an Ironman. It is likely that such mood depression is to some degree just another symptom of the general overtraining syndrome that commonly affects endurance athletes after such a test. Overtraining is known to disrupt brain neurotransmitters that influence mood. It has been hypothesized that as a symptom of overtraining, depression is your brain’s way of discouraging you from overexerting yourself again—in this case, doing your next Ironman—for a while.